NOTE: Demo showroom models ONLY - available for sale at our Newmarket and Indooroopilly locations. See in store for deal details. Introducing the ProForm 505 ZLE cross trainer! Incorporating both a front flywheel mechanism to provide a full, natural stride and an intensity ramp to easily switch your muscle group the exercise will focus on, this sturdy cross trainer will have you hitting your fitness goals in no time at all. The console features a clear back-lit LCD display, crisp stereo speakers for entertainment as you train, a breezy CoolAire fan to keep you cool and an iFit SD reader for limitless training options. Why pay for a personal trainer when you have iFit personal trainer technology? The Proform 505ZLE elliptical comes with a FREE iFit workout SD card that you simply plug into the console for your personal trainer certified pre-programmed workouts! Your iFit SD card will provide you with 6 weeks of progressive workouts, and automatically sets the resistance and speed for each workout to help you achieve maximum results! 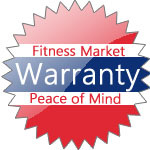 Additional iFit SD cards are available to purchase from Fitness Market under the iFit brand. Buy Pro-Form 505ZLE Elliptical Cross-Trainer from Fitness Market and save! With our efficient dispatching and quick delivery throughout Australia, Pro-Form 505ZLE Elliptical Cross-Trainer can be yours sooner. Below you can rate and add reviews for Pro-Form 505ZLE Elliptical Cross-Trainer. Love the adjustable ramp. My wife uses the lower setting on the ramp, and I prefer the higher setting for a harder workout. Resistance is good. Excellent machine.